With the latest iteration of the iPad hitting the shelves at local electronics stores and Apple stores, there are millions of people around the world with a portable entertainment console. The iPad’s versatility and sleek design make it one of the most attractive tablets on the market. Displaying high-resolution photos and videos is a priority for many, and the even better resolution on the latest iPad puts visual media front and center. Ready to learn more about iPad and what it can do for you? You’ve come to the right place. Get answers to all your frequently asked questions about Apple’s iPad tablet. Q: How do I manage / reset my Apple ID? A: Your Apple ID controls everything you do through your device from enabling iCloud to shopping on the iTunes store. You can manage your Apple ID by visiting https://appleid.apple.com. This page will allow you to edit your Apple ID information, recover your Apple ID in case you forgot it, or reset your password. You will of course need to know your Apple ID and password to access this information and edit it. You will have to sync your iOS device after you change any information by navigating to Settings -> Store -> Apple ID. Q: What devices support Apple Pay? When will Apple Pay be available? A: All devices with Touch ID (except the iPhone 5s) support Apple Pay, but not every iOS device can make in-store purchases. Only devices with an NFC chip can use the Apple Pay terminals at retail locations. Apple Pay is available on October 20, 2014 when iOS 8.1 is released. Only the iPhone 6 and 6 Plus or Apple Watch paired with an iPhone 5 or later can make in-store purchases. Devices without an NFC chip (iPad mini 3, iPad Air 2) can only make online or in-app purchases using Apple Pay and Touch ID. Q: How do I disable the App Store suggestions feature in iOS 8? This will put a stop to all those Apple suggested apps popping up when search your device. Q: Does Google Chromecast work with the iPad? A: Google’s HDMI streaming media player known as “Chromecast” works with all iOS devices running iOS 6.0 or later. This includes the iPad or 2 or later and iPhone 4s or later. It also works with Android 2.3 or later, Mac OS X 10.7 or later, Windows 7 or higher and most Chromebooks. The Chromecast is available from Amazon.com and Google Play for only $35. Q: How can I opt out of Facebook’s targeted ads? A: On June 12, 2014 Facebook announced it would be “making ads better by giving people more control”over what they see on their News Feed. The new targeted ads kicked off may false reports claiming Facebook was going to start sharing users’ web browsing history with advertisers. Facebook contends that it will not share your browsing history, even with its new targeted ads. Instead it uses people’s “Likes” and info from websites and apps to push relevant ads to your News Feed. Users can now decide what ads they want to see and want to remove by using Facebook’s ad preferences. You can learn more at Facebook.com/about/ads. If you want to opt out of interest-based ads showing up on your News Feed just navigate to Settings >Privacy > Advertising on your iPad and iPhone, and tap the “Limit Ad Tracking” slider so it turns green. You will also need to opt out of targeted ads on each individual computer and laptop you use to browse Facebook. To do this visit the Digital Advertising Alliance and use their form to opt out of targeted ads from any of the participating companies such as Facebook and Google. Remember, this will not remove ads from your Facebook News Feed. It will only remove the creepy ads that seem to track your web browsing history. Q: What are the best strategy games for the iPad? A: This article will be you solution. Q: What Nintendo games are available for the iPad? A: At this point there are no Nintendo games available for iOS devices in Apple’s App Store. Nintendo has made it clear that they have no interest in releasing their titles for mobile devices like the iPad or iPhone. Nintendo developer Takashi Tezuka said in an interview that it is “definitely possible” for them to create touch screen-based games, but they would only be released on a Nintendo platform. Meanwhile, developers like SEGA and DotEmu have been hapily releasing other retro titles like Sonic the Hedgehog and Double Dragon for iOS devices. So there is no shortage of classic games available for the iPad. Q: How can I backup my iPad with iTunes? A: Backing up your iPad data is important just incase something happens to your tablet such as accidental damage or theft. The backup process also simplifies transferring data from your device to a new iPad in the event of an upgrade. 1. Connect the iPad to the computer with a USB cable. 3. Click on your iPad under DEVICES in the left menu. 4. Make sure the Summary tab at the top of the iTunes window is selected. 5. In the Backup section, check the “Back up to this computer” button. 6. Click the Sync button on the lower right. You can also backup to iCloud to keep a copy of your iPad data on Apple’s servers. You need to set up an iCloud account using your AppleID. Q: How can I replace the iPad battery? A: In the event that your iPad battery no longer holds a charge, Apple will replace your iPad for aservice fee. The total charge is $105.95 per unit and service takes about a week. Apple is not actually replacing the battery on your iPad, they are replacing your iPad entirely. You must back up all of your data using iTunes or everything will be lost. As with other Apple mobile devices the battery is sealed inside the iPad and is not user serviceable. Apple will not replace your iPad if the battery is damaged in an accident or due to unauthorized service or disassembly. The iPad battery is intended to last 10 hours while surfing the web on Wi-Fi, watching video, or listening to music. Q: Can I jailbreak my iPad running iOS 8.1.2? A: The TaiG jailbreak tool, originally released for iOS 8.1.1, has been updated with iOS 8.1.2 support. 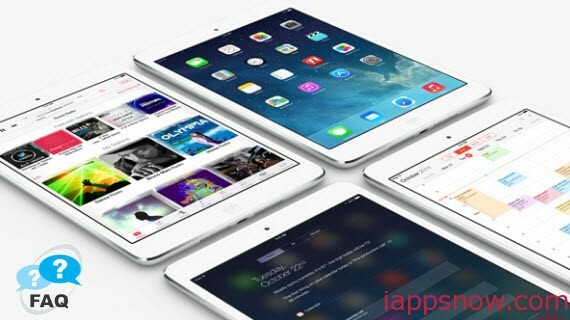 This means you can jailbreak any iOS device running iOS 8.1.2 including the iPad 2, iPad 3, iPad 4, iPad Air, iPad Air 2 and all three iPad mini models. You can learn how to jailbreak any device running iOS 8.0 to iOS 8.1.2 by hitting the appropriate link below. Q: What video formats will the iPad play/support? A: Here is iPad Mini 3, iPad Air 2 best video format, and also learn iTunes supported format. Q: Will the iPad play/support AVI video files? Q: Does the iPad support 1080p or 720p video playback? Best video tools for iPad suggested? Q: What is the best video player for iPad? A: Get Best Video Player Apps for all iPad Models here.